Martyl (1917–2013) and Alexan­der (1912–1996) Langs­dorf pur­chased the home of mas­ter archi­tect Paul Schweikher in 1953. Martyl, a life-long fine artist, fell in love with the for­mer archi­tec­tural stu­dio and used the space to paint her mas­ter­pieces until her death in 2013 at the age of 96. Martyl and her hus­band, Alexan­der, a physi­cist who stud­ied at MIT and at the Uni­ver­sity of Cal­i­for­nia, Berke­ley before mov­ing to Chicago in 1943, had come to the Windy City at the invi­ta­tion of Enrico Fermi to begin work on what was then the top secret Man­hat­tan Project at the Uni­ver­sity of Chicago. Both Martyl and Alexan­der were natives of St. Louis. Before com­ing to Chicago, Alexan­der had helped build a cyclotron at Wash­ing­ton Uni­ver­sity in St. Louis. Unre­lated to her husband’s sci­en­tific work, Martyl also had a hand in the his­tory of atomic sci­ence. She designed the Dooms­day Clock for the June 1947 issue of The Bul­letin of the Atomic Sci­en­tists. This uni­ver­sally rec­og­nized clock is still used to denote the world’s impend­ing vul­ner­a­bil­ity to nuclear war. 1917 Mar 16th Born in St. Louis, Missouri. 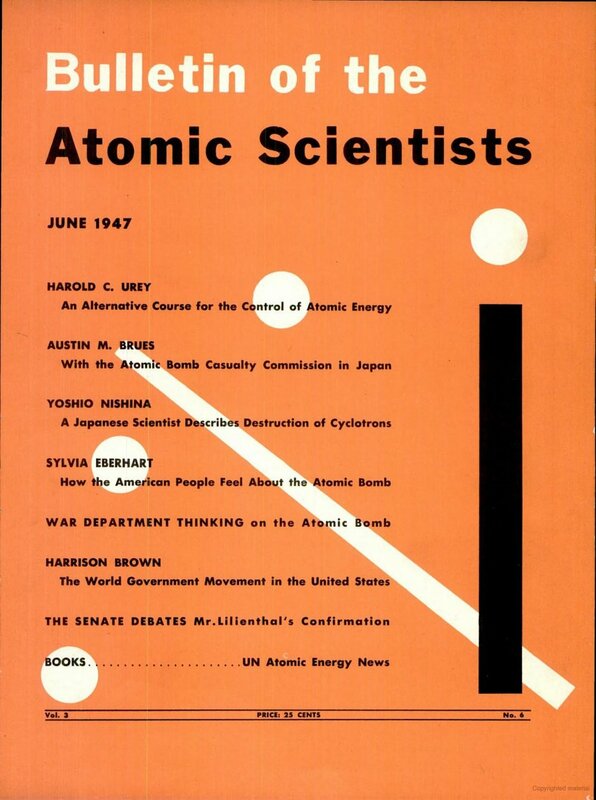 1942 Married Alexander Langsdorf, Jr.
1947 Designed the Doomsday Clock for the Bulletin of Atomic Scientists. 2013 May 26th Died in Schaumburg, Illinois. Pentagram has updated the image of the Doomsday Clock, the graphic symbol of the world’s proximity to nuclear annihilation. The clock is the emblem of the Bulletin of the Atomic Scientists, the advocacy group formed in 1945 by scientists from the Manhattan Project. The redesign, developed by Michael Bierut and Armin Vit, coincides with the group’s decision to move the clock forward from seven to five minutes before midnight, or metaphorical doomsday. The move forward reflects the increasing availability of nuclear weapons and the effects of climate change. The Bulletin of the Atomic Scientists announced the two-minute move forward today. Alexander Langsdorf Argonne Lab around 1965. 1938 Became a research fellow at the University of California at Berkeley. 1939 to 1942 Worked as a physics instructor at Washington University in St. Louis. 1943 to 1945 Worked on the Manhattan Project in Chicago. 1945 to 1977 Worked at Argonne National Laboratory until retirement. 1996 May 24th Died in Chicago, IL.